(SOLD) Sold in New York at Christies in February 2013 this pair of gilded French Louis XVI bergere were listed as being stamped "SENE". Fortunately we have been able to distinguish the B, before Sene, so we can be sure that these are by Jean-Baptiste Claude. The preceeding I, we cannot see. The stamps are, alas, usually in a position that is damaged when the chairs were sprung in the 19th century. Common problem! However, since there were four Sene, three of which worked in this genre, the faint but conclusive B is important. Jean-Baptiste is the Sene of choice as he was the favourite chair maker (menuisier) to Marie Antoinette. Many examples of his work still remain throughout the former royal palaces: chairs, beds, fire screens. Coming from a dynasty of menuisier Jean-Baptiste was born in Paris 24th October 1748, and died in 10th February 1803. He was received as a master on May 10th, 1769, and his workshop was in the rue de Clery. You can see his work at Roy's Antiques, the Louvre, Versailles, the Camondo Museum, Chateaux de Bois, Morlanne and d'Evreaux, New York's Metropolitan Museum etc. A set of furniture he made for Marie Antoinette's dressing room in the ill fated Chateau Saint Cloud (it burned down!) was originally covered with upholstery embroidered by Marie Antoinette.There is also a paper label underneath stated these were once sold by Dalva Brothers, New York, est 1933. Dalva Bros have supplied the Louvre, Metropolitan and Getty Museums. 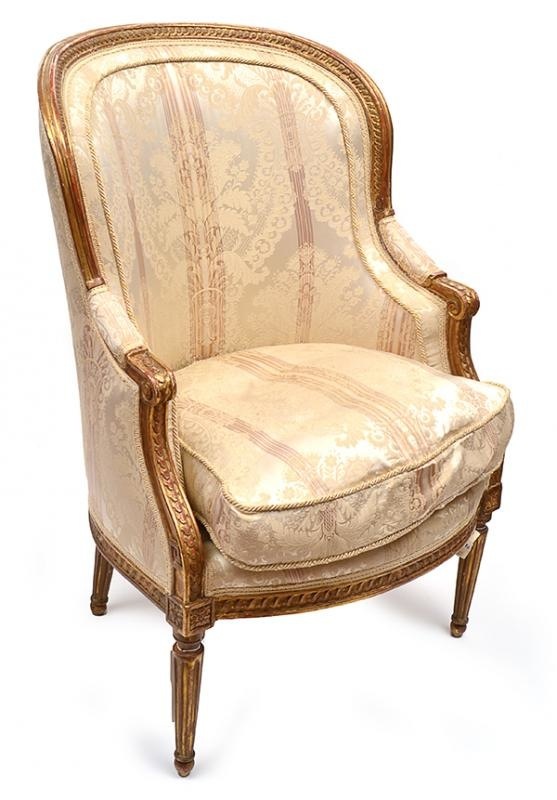 (SOLD) Sold in New York at Christies in February 2013 this pair of gilded French Louis XVI bergere were listed as being stamped “SENE”. Fortunately we have been able to distinguish the B, before Sene, so we can be sure that these are by Jean-Baptiste Claude. The preceeding I, we cannot see. The stamps are, alas, usually in a position that is damaged when the chairs were sprung in the 19th century. Common problem! However, since there were four Sene, three of which worked in this genre, the faint but conclusive B is important. Jean-Baptiste is the Sene of choice as he was the favourite chair maker (menuisier) to Marie Antoinette. Many examples of his work still remain throughout the former royal palaces: chairs, beds, fire screens. Coming from a dynasty of menuisier Jean-Baptiste was born in Paris 24th October 1748, and died in 10th February 1803. He was received as a master on May 10th, 1769, and his workshop was in the rue de Clery. You can see his work at Roy's Antiques, the Louvre, Versailles, the Camondo Museum, Chateaux de Bois, Morlanne and d'Evreaux, New York's Metropolitan Museum etc. A set of furniture he made for Marie Antoinette's dressing room in the ill fated Chateau Saint Cloud (it burned down!) was originally covered with upholstery embroidered by Marie Antoinette.There is also a paper label underneath stated these were once sold by Dalva Brothers, New York, est 1933. Dalva Bros have supplied the Louvre, Metropolitan and Getty Museums.